Another opportunity to sample more of Gilmour’s unique brand of melodic magic… and who’s that on vocals? The tune is pretty straightforward except for some rhythmic syncopation. You’ll need a fairly good pre-bend technique for the solo parts. That singing tone, that sweet vibrato, those funky little double-stops – it can only be the golden touch of David Gilmour. After almost quarter of a century, this track, along with other Floyd classics, is still one of the most frequently requested transcriptions. The chords are pretty simple, the riffs straightforward and the solos mainly pentatonic, but it all sounds remarkably fresh and vibrant. This is mainly due to the fabulous interplay between guitar and keyboards, as well as the impassioned vocal performance of a certain Roy Harper doing his best “I’m not Roy Harper” impression. The story goes that David wanted Roger to sing it and Roger wanted David to sing it, so Roy sung it by default. Whatever happened, the result is an amazing track dissected for your pleasure. There are a few things to look out for – one being the odd bars of 5/4 that crop up sometimes. To count a bar of 5/4, instead of simply counting 1, 2, 3, 4 (for a bar of 4/4) you count 1, 2, 3, 4, 5. Yes, it really is that simple! Performance-wise, the left channel (part 1) shouldn’t be a problem. Try for a clean, chunky sound with the tiniest hint of distortion and, of course, a flanger. There are various different overdubs on this track and I’ve condensed them all into part 2. For the intro, part 2 doubles some of part 1’s lines, as well as adding some tasteful little fills. Listen to the space in this track, everything has got room to breathe. It’s a great example of ‘less is more’, with Gilmour opting for single bends garnished with a touch of vibrato to draw the listener in. Most of the fills are either in the open position or at the 12th fret (which is essentially the same) and all the notes can again be found in the E blues scale except for the occasional C# (major 6th). This is a cool note to use over the E minor chords, but if you want to improvise over the rest of the track, beware of the C major chord as the C# doesn’t sit comfortably. One particular technique that Gilmour uses to great effect is the pre-bend. This is achieved by bending the A (G string, 14th fret) up to a B (G string, 16th fret) before you actually play the string. Once you’ve bent the string up, pluck it and let the string down again (see bar 120). This produces a sort of crying effect very popular with blues guitarists. There is a certain amount of guess-work involved when bending the string up in the first place as you can’t check to make sure it’s in tune until you play it, by which time it’s too late. But, after a bit of practice, you should get used to what a tone interval feels like on the G string, B string or top E. Another technique that David uses are these funky little diads (two notes played together). These are great for adding intensity to the track as well as giving the music an extra rhythmic kick. 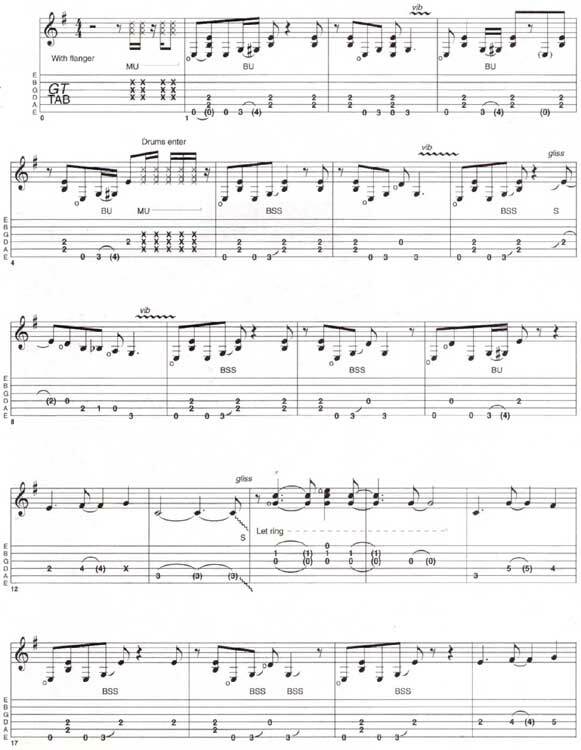 It’s a part of Pink Floyd Have a Cigar guitar tab and sheet.